entertaining – What's Cookin' @ Special Collections?! Need a New Years’ Eve/Day Candy Rush? Happy (almost) New Year! Special Collections is still closed, but we don’t want to leave you recipe-less or uninspired on the cusp of 2016. If you need some last minute candies for guests or a sugar rush for yourself, this week’s feature will help! 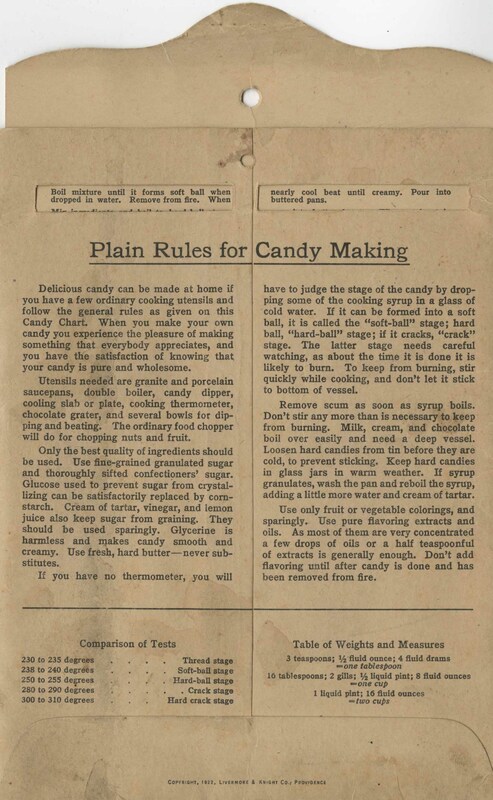 It’s Plain Rules for Candy Making, published in 1922. It’s not a book or even a pamphlet. Rather, it’s a double-sided card. We’ve seen some similar items before in the Cocktail History Collection, but this is the first candy-based one we’ve acquired. Plain Rules for Candy Making, 1922. Advertisement and ingredients for Maple Sugar Fudge. Plain Rules for Candy Making, 1922. General instructions and directions for Maple Sugar Fudge. Plain Rules for Candy Making, 1922. Advertisement and highlighted recipe for Cocoanut Macaroons (other recipes above). Plain Rules for Candy Making, 1922. General instructions and directions for Cocoanut Macaroons (other recipes above). For the most part, Plain Rules for Candy Making speaks for itself. Also, while your usual archivist/blogger Kira planned ahead and wrote this back on December 16, it’s the holiday season and there are more important (but only slightly more fun ;)) things to do than read a long blog post. However, before we part ways until 2016, there are a few points worth making. 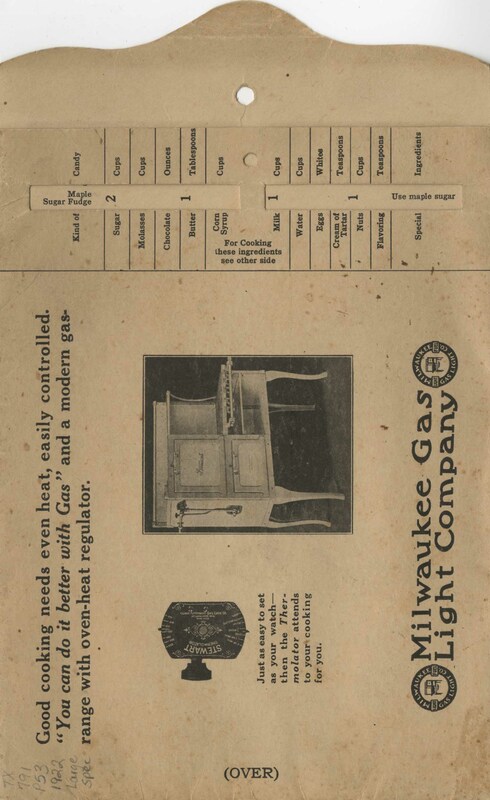 First, this sliding recipe card comes from Livermore & Knight Co., no strangers to the History of Food and Drink Collection. They published the set of tiny cookbooks you may have read about on the blog before in “A Tiny Post on Some Tiny Books” and “From Tiny Books to Chunky Books.” Apparently, quirky and unique methods of sharing recipes was there thing. Second, it’s a good reminder that there are connections to be made through the collection and not always in obvious ways. We have a variety of books it the collection that don’t contain related content, but are connected by other elements like publisher, which makes them an interesting study for other reasons (did a publisher produce books that all looked a certain way? focused on a certain theme/ingredient? contain a shared element?). Perhaps we’ll take some of that up…next year. Happy New Year (and be sure to join us for a whole new year of feature items in 2016)!